Born in madhuramangalam, he was named krishNan by his parents rAgavAchAryar and jAnaki ammAL since he was born on the same thirunakshathram as krishNa and periyavAchAn piLLai. He was born in the glorious srIvathsa lineage. He was born in the year 1805 CE. His parents performed all applicable vaidhIka samskArams for him at the right ages. Even at a young age, he had great attachment towards emperumAn. In his childhood, He was always playing with divine vigrahams of emperumAn and showed great attachment towards bhagavath vishayam. After some time, his father wanted to look for a bride for him to have him married. His father set out on a journey and krishNamAchAryar accompanied him in the journey. On the way, he observes a couple with their child also travelling at the same time. He sees that the husband is carrying lots of luggage and the child as well and is often seen quarelling with the wife but was also being submissive towards her due to his attachment towards her. krishNamAchAryar was struck with the miseries of married life and at once calls out his father and says that he never wants to get married. He was then blessed with AchArya sambandham when his AchAryan visits his village (kappiyAmUr). kOil kanthAdai rangAchAryar performs pancha samskAram to him and teaches the essential principles of sath sampradhAyam. He also starts going to many yAthrais along with his AchAryan and serves him constantly. 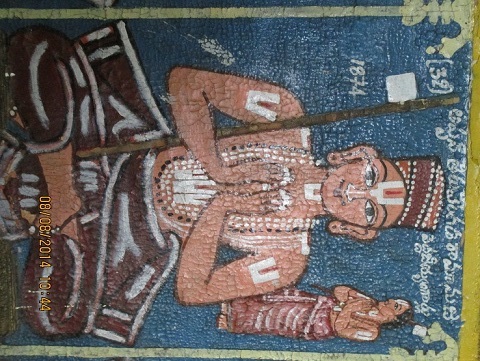 Once when he was in thiruvEnkatam, embAr appears in his dream and invites him to madhuramangalam and instructs him to bring a shawl as he was feeling very cold. krishNamAchAryar goes to thiruvEnkatamudaiyAn to request his permission to leave and thiruvEnkatamudaiyAn blesses with his own shawl which is carried by him and submitted to embAr at madhuramangalam. Subsequently, by the grace of embAr, krishNamAchAryar develops great desire to accept sannyAsAsramam. 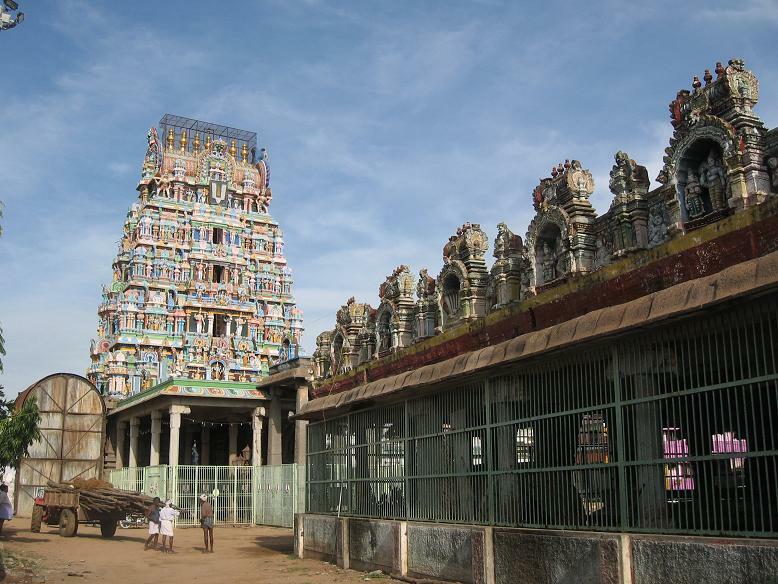 He returns to thiruvEnkatam and requests vakuLAbharaNa jIyar (periya jIyar) to bless him with sannyAsAsramam. vakuLAbharaNa jIyar feels krishNamAchAryar is too young and informs him to wait for some more time. But krishNamAchAryar insists that by the grace of embAr he has become totally detached and cannot continue without the sannyAsAsramam. vakuLAbharaNa jIyar then says, if perumAL sanctions it, he will proceed. jIyar then leaves to thirumalai and on his way he observes a properly prepared thridhaNdam and collects that. When he lies down to rest, emperumAn appears in his dream and instructs him to bless krishNamAchAryar with that thridhaNdam and crown him with sannyAsAsramam. periya jIyar then happily invites him and blesses him with sannyAsAsramam. 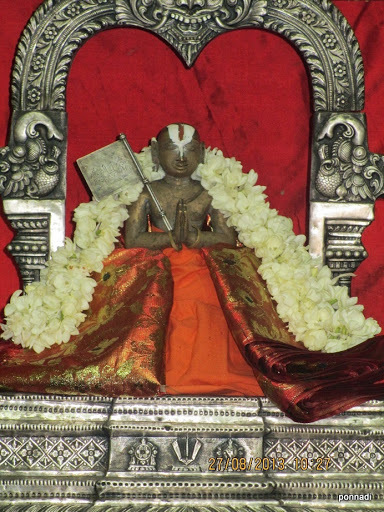 Since vakuLAbharaNa jIyar knew the great attachment of krishNamAchAryar towards thiruvEnkatamudaiyAn, he names krishNamAchAryar as thiruvEnkata rAmAnuja jIyar. 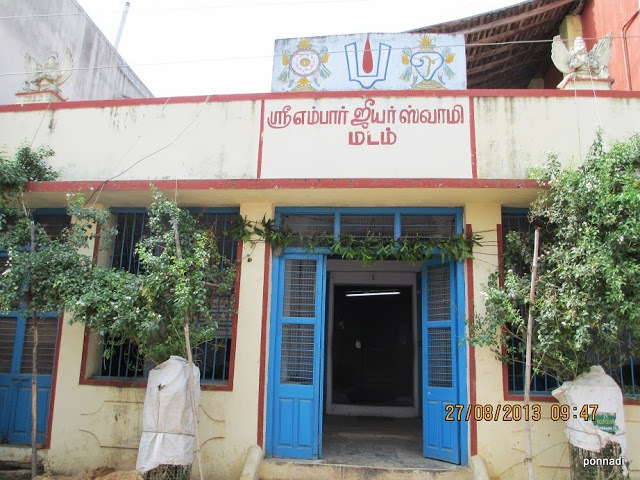 He returns to madhuramangalam and serves embAr for some time and becomes to be popularly known as madhuramangalam embAr jIyar. He travelled to many dhivya dhEsams and finally arrived at srIperumbUthUr to stay there and serve emperumAnAr at his avathAra sthalam. His sishyas arranged for a mutt for him to stay in the south side of the temple and he started living in that mutt. Several srIvaishNavas approached him and studied the pure principles of our sath sampradhAyam during his times at srIperumbUthUr. He expertly explained the principles in our pUrvAchArya srIsUkthis and nurtured many vidhwAns (scholars) during his time. He lived for a short time (77 years) in this leelA vibhUthi and ascended to paramapadham on vishu varsham thai month krishNa paksham thrayOdhasi thithi. 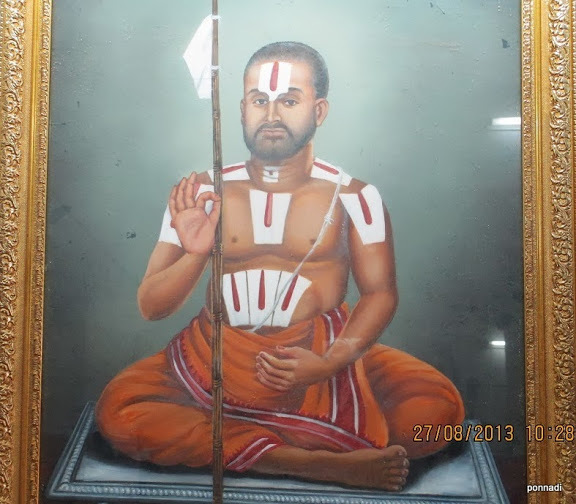 One of his most important works is the arumpadham (detailed explanations) for mAmunigaL‘s vyAkyAnam for piLLai lOkAchAryar‘s srIvachana bhUshaNam. Not only he wrote a commentary for the magnum opus of our sath sampradhAyam (srIvachana bhUshaNa dhivya sAsthram) , he also lived a life of total dedication to bhagavath/bhAgavatha kainkaryam as highlighted in srIvachana bhUshaNam. He had also written several other granthams to establish the principles of our sath sampradhAyam. 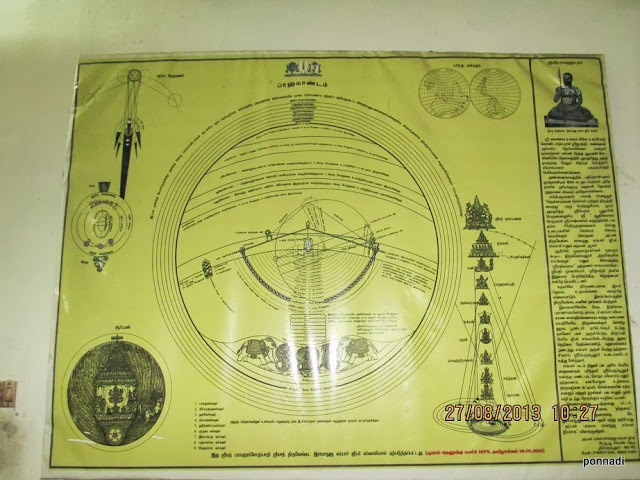 He also explained the structure of the brahmANdam very nicely based on the descriptions in vishNu purANam, thathva thrayam, yathIndhram matha dhIpikA, etc. This structure was represented in a pictorial form and was recently re-published by the sincere efforts of one srIvaishNava named Sri Ravi. Thus, we have seen some glimpses of the glorious life of appan thiruvEnkata rAmAnuja embAr jIyar. He was a great scholar and has contributed greatly to our sampradhAyam through his literary works. Let us pray at his lotus feet that we too get a little bit of such gyAnam/bhakthi in bhagavath/bhAgavatha/AchArya vishayam. This entry was posted in other AchAryas on August 28, 2013 by sarathyt. Thanks Swami. Are the 23 works are available now? not sure swamy. Some are available – like srIvachana bhUshaNa arumpadham, brahmANdam (bhUkOL nirNayam). but beyond that, we need to set out to search for those. Adiyen, wonderful detailed work Sarathy swami! Enlightening and eye opening!